A House committee will investigate the Federal Communications Commission’s (FCC) decision to allow a waiver granting favorable status in wireless auctions to an Obama donor, the committee announced Thursday. 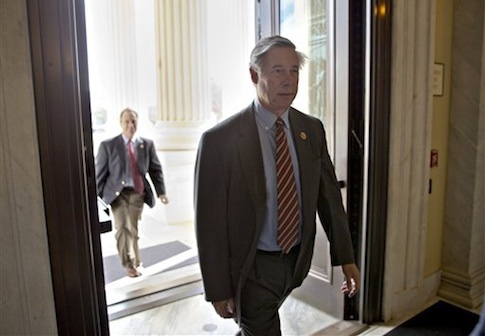 Chairman of the House Energy and Commerce Committee Fred Upton (R., Mich.) sent a letter to FCC Chairman Tom Wheeler asking for information and documents relating to the designation of Grain Management, LLC as a "designated entity" last week. The status will allow the company to receive discounts designed for small businesses when bidding for wireless licenses. David Grain, a major bundler for Barack Obama’s 2008 presidential campaign, owns the firm. "The Energy and Commerce Committee is committed to conducting vigorous oversight to ensure that Commission processes are fair, open, and transparent, and that they serve the public interest," read the letter, which is signed by Upton, chairman of the Subcommittee on Communications and Technology Greg Walden (R., Ore.), and Chairman of the Subcommittee on Oversight and Investigations Tim Murphy (R., Pa.). "The granting of the Grain Management waiver raises questions about these processes," the letter reads. Republican FCC Commissioner Ajit Pai called the waiver "unlawful" and "absurd," since Grain Management did not satisfy the requirements to obtain status as a designated entity (DE). In order to obtain DE status, which is intended to foster competition by allowing smaller and minority-owned businesses to compete in wireless auctions, a company must pass what is known as the attributable material relationship (AMR) rule. AMR prohibits companies that lease more than 25 percent of their spectrum capacity to another company. Grain Management leases 100 percent of its capacity to Verizon and AT&T. The House committee is now asking the FCC to provide all communications between the FCC and Grain Management since Nov. 4, 2013, as well as any emails or communication between members of the FCC about the company, by August 15. The committee also asked for copies of draft versions of the order to grant Grain a waiver from the AMR rule, as well as a list of each waiver of the rule the FCC has granted since its adoption in April 2006. Upton and Walden previously said the Grain decision "smells rotten." David Grain raised between $200,000 and $500,000 as a bundler for Obama’s campaign in 2008, and donated $64,400 to the DNC and Democratic congressional committees in that election cycle. Grain also began donating to Rep. Jim Clyburn (D., S.C.) soon after his daughter Mignon Clyburn was appointed a Democratic FCC commissioner in August 2009. He has donated $8,400 to Rep. Clyburn between November 2009 and May 2012, according to the Federal Election Commission. His wife, Lisa Grain, contributed an additional $7,400 to Clyburn. This entry was posted in Issues and tagged Democratic Donors, FCC. Bookmark the permalink.